In a recent Q&A with YouTube viewers, President Obama said that U.S. drug policy focuses too heavily on law enforcement. He also took a huge step forward calling drug legalization an "entirely legitimate topic for debate." If you haven't taken action on the email alert I sent you last week, please take a minute to do so now. We have a great opportunity to cut funding for arrests and incarceration by treating drug use as a health issue instead of a criminal issue. Tell President Obama to stop wasting money on the failed war on drugs. In his State of the Union address a few days ago, President Obama said it is time for the federal government to tighten its belt and stop wasting so much money. One of the biggest – and most destructive – wastes of money is the war on drugs. President Obama is working on a new federal budget – urge him to stop wasting money on the failed war on drugs. In these times of deficits and budget cuts, let’s send a clear message: no more money for marijuana arrests. No more money for laughably stupid anti-marijuana ads. No more money for random drug testing. No more money for SWAT raids on people's homes for suspected drug law violations. No more money for long prison sentences for low-level, nonviolent drug offenses. No more money for the drug war. Period. Tell the President that our tax dollars should be spent more wisely. With your help we can eliminate or cut drug war waste and dismantle the war on drugs. Please take a minute to write the White House and tell President Obama to stop wasting your tax dollars on failed drug policies. A group of world political leaders, intellectuals, and businessman Richard Branson have formed a Global Commission on Drug Policies in a bid to boost the effort to achieve more humane and rational drug laws. The commission is headed by former Brazilian President Henrique Cardoso and builds on the work Cardoso and former Mexican President Ernesto Zedillo and former Colombian President Cesar Gaviria did with the Latin American Commission on Drugs and Democracy. The commission's goals include reviewing the basic assumptions, effectiveness and consequences of the 'war on drugs' approach; evaluating the risks and benefits of different national responses to the drug problem; and developing actionable, evidence-based recommendations for constructive legal and drug policy reform. The commission will issue a report in six months. The commission will examine the current international drug control regime, conduct a global overview of drug policies and laws, examine the drug production and supply chain, address criminal justice challenges, study the lessons learned from harm reduction, treatment, and prevention campaigns, and examine the economic and political ramifications of the massive illicit global drug trade. 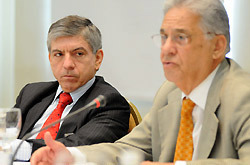 In addition to the three Latin American ex-presidents, commission members include former US Secretary of State George Schulz, writers Carlos Fuentes and Mario Vargas Llosa, former European Union official Javier Solana, former Swiss President Ruth Dreifuss, and former UN High Commissioner for Refugees Thorvald Stoltenberg. "There is a growing perception that the "war on drugs" approach has failed," the commission said in a statement as it announced its existence in Geneva this week. "Eradication of production and criminalization of consumption did not reduce drug traffic and drug use," the commission said. The harm from corruption and violence resulting from prohibition "largely exceeds the harm caused by drugs," the statement says. We will be looking forward to seeing the commission's report this summer. The report from the Latin American Commission helped stir debate and advance the cause of reform, and this should, too. The high price of enforcing criminal penalties on non-violent offenders has Georgia's new Republican governor rethinking a major linchpin in US domestic policy: the drug war. Roughly 19 percent of Georgia's prison population was incarcerated on drug offenses in 2009, according to a report by the Office on National Drug Control Policy. Nationally, nearly half of all arrests are due to laws criminalizing the cultivation, sales and use of cannabis, which has been shown to be less damaging to human health than alcohol or tobacco.